Our focus for this month’s essence review is on the Wild Orchid Flower Essence, which is one of our Karmic Essences. There are ten essences included in the Karmic Flower Essences range. Seven of them relate directly to one of the personality groups identified by Dr Bach. Each of these essences helps to release unconscious beliefs underpinning the surface personality issues in a particular personality group. 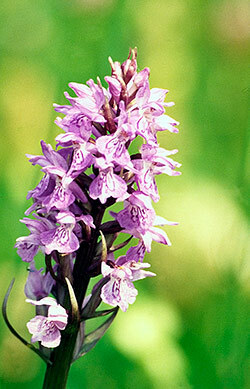 Wild Orchid is the deep acting Karmic Essence that relates to the Uncertainty Group. The Bach Flower Remedies that Dr Bach put into his ‘Uncertainty’ group were Cerato, Gentian, Gorse, Hornbeam, Scleranthus & Wild Oat. All these states come about as a result of an underlying and deep-seated belief in separation, which is often experienced as an inability to fully connect with our intuitive guidance, our multidimensional selves or Source. Without this connection it is challenging to guide ourselves through life from a foundation based on inner knowing and intuition. Often this results in great doubt, uncertainty, indecision, contraction, procrastination, avoidance tactics and a sense of hopelessness because life inevitably feels stuck. Where these are very deep-seated patterns you will probably be able to look back into your family patterning and see that it is a shared vibration, one that you have grown up with that perhaps feels ‘normal’ because of this. Sometimes the vibration of uncertainty is reinforced in childhood by well-meaning but misguided care-givers who feel that they know what is best for us based on their own experiences. As a result, they deprive of us of the opportunity to choose for ourselves and then act on what feels right for us. Uncertainty in later life is often the legacy that we inherit as a result. Another cause of deep rooted doubt and uncertainty can be the result of past life experiences where we have chosen a course of action that from our perspective at the time, turned out to be less than perfect. An underlying doubt in our ability to make wise choices can be the result of experiences like this, which in turn manifest as uncertainty and procrastination for no obvious reason in the current life. In our experience, Wild Orchid is a powerful essence to help combat the vibrations of doubt, uncertainty and lack of trust. We have used it many times over the years when feeling challenged by the need to make a decision about something that seemed important, or when facing that most uncomfortable vibration of uncertainty in our ability to achieve what appears to be required. We would also say that doubt and uncertainty can also be quite a subtle vibration, so if you find yourself unaccountably stuck or tending to procrastinate about something in your life, then consider a bottle of Wild Orchid to help. Take 4 drops 3 or 4 x a day directly from the stock bottle for as long as needed to create a shift in the energy of the pattern you are working with. The amount of time needed for this to happen can vary from a couple of days to a week or more depending on the circumstances. In our experience it is not unusual to finish a whole bottle before all possible transformation feels complete. We do not recommend giving Karmic Essences to children under 12 years of age.